Relevant? I would say that shouldn't be a question any longer this year. Brian Kelly and his squad walked in to Memorial Stadium as a double digit underdog and dismantled No. 8 Oklahoma, 30-13 on their home turf in front of a record crowd of 86,031. Notre Dame is still undefeated at 8-0 and now ranked in the Associated Press Poll at #4 as Kelly and the boys are squarely in the mix for the BCS Championship after Saturday night. The college football world will have its eyes on the Irish as they look to potentially capture the BCS crystal ball come January. This game revived what was once a rivalry between two traditional college football powers in the old days and the first contest between the two schools since 1999, Bob Stoops first season at the helm. Running back Cierre Wood put the Irish on the board as he scampered untouched down the middle of the field for a 62-yard touchdown run moments after the Sooners opened the scoring on a 28-yard field goal. Irish quarterback Everett Golson returned to the starting lineup after missing the BYU contest for precautionary reasons after suffering a concussion two weeks ago. Golson threw for 177 yards and dove in the end-zone for a 1-yard touchdown late in the fourth quarter. "What we'd been hearing was a lot of people didn't think we could win this game. That kind of just added that fuel to my fire that was already burning," said Golson. "We just wanted to come out and show them that we can." Oklahoma quarterback Landry Jones threw for 356 and no touchdowns. Wide receiver Jalen Saunders snagged 15 passes for 181. Irish senior linebacker Manti Te'o helped his Heisman cause by intercepting a pass late in the game to swing momentum. Te'o compiled 11 tackles and added a sack of Jones to end one drive. Te'o stated "We've come a long way, we're going to continue to get better. Thats our main goal right now. Just continue to get better and not be satisfied with being 8-0." Te'o and the second-ranked Irish defense did give up some yardage in the air but it was the underneath passes that were given up. "That was the way we set up. We were going to give up yards to keep the points down," Kelly said. "We could not let the points get out of reach for us." The Irish defense prevented the Sooners from hitting the big play and making the Sooners settle for field goals. Backup quarterback Blake Bell did get in the end-zone to tie the game at 13 midway through the 4th quarter. "With this defense, when somebody scores, we get really frustrated," Te'o said. "I think it showed our maturity by how we rallied after that touchdown. We just kept going." Notre Dame running back Theo Riddick added a late touchdown run as the Fighting Irish tallied 20 fourth-quarter points. The Sooners couldn't seem to break the Irish defense to produce points. "We moved it well. We threw and caught it well. It seems when we got to the 35, we sputtered down," Jones said, "but give credit to Notre Dame." There still may be a few doubters out there but they are dwindling with every Irish victory. The Irish are the only team in the country with four wins versus Top 25 teams, including two on the road against top-10 teams. "We really don't think about that. We really don't care what other people think of us," coach Kelly stated. "(The players) really just care about each other, Notre Dame and winning football games. They'll let everybody else decide who we are." - Irish defense gave up 379 total yards but only a total of 15 yards rushing. - Theo Riddick had 19 carries for 74 yards and 1 TD. Cierre Wood also had 74 yards rushing on the day with his 7 carries including the 62 yard TD run. Wood's 62 yard run is the Irish's longest run of the season. - TJ Jones grabbed 5 balls for 55 yards, Freshman Chris Brown caught his first ball of the year for a big 50 yard gain. So how does the old saying go? "Defense wins championships and offense wins games". Notre Dame's defense has played lights out through the first seven games this season, led by Heisman candidate and senior linebacker Manti Te'o. Its going to take more than just stellar defense to stop the high powered Oklahoma Sooners. The toughest matchup of the season for the undefeated Irish comes this Saturday night in the hostile grounds of Norman, Oklahoma as the Irish put their 7-0 record up against the one loss Sooners. The Sooners dynamic offense is led by senior quarterback Landry Jones. Jones offense is currently ranked 17th nationally but has yet to encounter a stifling defense like the Irish. Jones is by far the best passing quarterback the Irish have seen all season. Jones is surrounded by a bevy of offensive talent that will surely look to put pressure on the secondary of Notre Dame. For the Irish to win they will need to prevent the big plays downfield and will need to force Jones into making mistakes. That is a daunting task for the Irish defense but a task that they have relished in all season. Irish quarterback Everett Golson has been cleared to play and will start this Saturday night. Golson sat out last week's BYU game due to a concussion suffered in the Stanford game the week before. Golson will need to grow up fast in that intimidating atmosphere and limit his mistakes. The momentum the running game has given the team in past weeks will need to be on display again for the Irish offense to put points on the board. Golson is going to have to beat the Sooners with his arm, as the Sooners are likely to load the box in an attempt to force Golson to throw. It has been 10 years since Notre Dame was still in the mix for the BCS National Championship hunt this late in the season. Head coach Brian Kelly has his troops looking more and more like the Cinderella story of the year. The pressure this week has been placed squarely on the shoulders of Oklahoma coach Bob Stoops and his squad to win at home more than it will be for Notre Dame to go 8-0 since the Sooners are an 11 point favorite. No one predicted the Irish to be in this position let alone undefeated with the schedule they have endured this season. This is the type of game that Irish fans have been expecting all year, dominating both sides of the ball in the 2010 Hyundai Sun Bowl. Friday’s 33-17 victory of the Miami Hurricanes (7-6) in a very unseasonably cold El Paso, Texas put an exclamation point on a up and down season and will give the Irish and coach Brian Kelly momentum heading into the 2011 season. Irish freshman quarterback Tommy Rees struck the Hurricanes early with two quick touchdown passes to Michael “Money” Floyd that took the air out of the sail of a reeling Miami squad. With the decisive victory, Brian Kelly became the first Irish coach to win a bowl game in his first appearance since Dan Devine in the 1976 Gator Bowl. Notre Dame (8-5) scored on three of their first four possessions of the game. Rees completed TD passes of 3 and 34 yards to Floyd and Cierre Wood scored on a 34-yard scamper before kicker David Ruffer belted field goals of 40, 50 and 19 yards and even missed his first attempt of his career late in the game. "It's not hard when you're throwing the ball to Mike," Rees said. "He's such a great player. I knew that if I threw it anywhere near him he was going to make the catch." Rees hardly looked like a freshman making only his fourth career start as he completed 15 of 29 attempts without an interception for 201 yards. The win also marked the first time a first year starting quarterback for the Notre Dame won a bowl game. If you think about the four games Rees has started I almost guarantee this will never be matched. Rees four games were started in Notre Dame Stadium, Yankee Stadium versus Navy, the Coliseum versus U$C and in a bowl game versus Miami. That’s a nice resume for anyone. The game sold out in 21 hours, the fastest in the Sun Bowl's 77-year history, and the crowd of 54,021 set a bowl attendance record. Many fans wore Notre Dame jackets to ward off the 34-degree weather as a round of overnight snow dusted the Franklin Mountains. The warm-weather Hurricanes -- many wearing head covers under their helmets -- struggled much of the afternoon. "They call it football weather for a reason. You can't make any excuses," Miami center Tyler Horn said. Jacory Harris was ineffective and later taken out of the game due to an “ankle injury” as it was noted. Harris was 4-7 for 37 yards and 3 interceptions – all three were by Irish safety Harrison Smith. Robert Blanton also corralled an interception during the turnover binge. "It was a total defensive effort," Smith said. "When you knock the receivers off and mess up the timing with the quarterback, it really makes it easier for the safeties." The Canes trailed 27-0 late in the first half before the change was made for quarterback Stephen Harris taking over the offense. Morris did throw two late touchdown passes to try and make a game but it wasn’t nearly enough. Morris finished the game completing 22 of 33 passes for 282 yards and those two touchdowns. "Early on, we weren't all on the same page," Miami receiver Leonard Hankerson said. "I don't want to say we weren't focused but we weren't making any plays." It was a rough finish to a tough season for the Hurricanes, who saw coach Randy Shannon fired in November. Newly hired coach Al Golden watched from a Sun Bowl suite. He saw a team that needs a lot of work. But not everything went perfectly for the Irish. Ruffer as I stated before missed wide right on a 36 yard try for his first miss in 24 career attempts. I will give this to Ruffer though; he did attempt the try after hyper extending his planting knee a few minutes prior to the kick. Linebacker Manti Te’o sat out most of the second half with what looked like a gruesome knee injury but later it was stated that he could have played if needed. Floyd was also seen sitting on the sideline after being dinged up and Rees at one point had his knee tangled and limped off the field but played the remainder of the contest. The Irish started 1-3 under Kelly and consecutive October losses to Navy and Tulsa left them in precarious position to even get bowl eligible. But Notre Dame finished with four straight victories against Utah, Army, Southern California and Miami that should buoy hopes for the future of the program. "Clearly, we are gaining a lot of confidence," Kelly said. "We've beaten some good football teams late in the year as we've come together and found our identity. It's going to taste a whole lot better in the offseason talking about a win." "Those 15 practices from USC to now helped a lot," Rees said. "They took some of those mistakes out." - Robert Hughes finished with 27 carries for 81 yards. Cierre Wood had 12 carries for 81 yards and 1 score. You can hold me to this prediction… Saturday night Auburn’s all world quarterback Cameron Newton will be at the podium thanking his teammates, coaches, family and friends for him being named the 2010 Heisman Trophy winner. Here is a breakdown of the four players invited and their résumé’s from 2010. 1. Cameron Newton, QB, Auburn: Newton became only the second player in NCAA history to run and throw for 20 touchdowns in a season with Tim Tebow being the first. Newton finished the season with a quarterback rating of 188.2. He tallied 2,589 yards in the air and tossed 28 touchdowns. Newton managed only 6 interceptions and finished with a staggering completion percentage of 67.1. Newton finished the season with 1,409 yards rushing on 5.8 yards per carry and 20 rushing TD’s. 2. LaMichael James, RB, Oregon: James is the best running back in the country. James scurried for 1,682 yards on the ground while adding 21 touchdowns. His 6.0 yards per carry average is just plain awesome. James also added 13 catches for 169 yards and 1 TD. 3. Kellen Moore, QB, Boise State: Moore will have on his shoulders the fact that he couldn’t hold the lead and eventually lost to Nevada in that classic game a few weeks back. The loss is really the only blemish on his otherwise magnificent season. Moore’s quarterback rating was a staggering 185.0. He threw for 3,506 total yards while adding 33 touchdown and only 5 interceptions. His completion percentage on the season was a head turning 71.0%. 4. Andrew Luck, QB, Stanford: Luck also played on a team with just one loss on the season. Luck now holds the Cardinal single-season record for touchdowns with 28 against 7 interceptions. Luck’s passer rating was an impressive 166.1. He threw for 3,051 yards and ran for an additional 438 yards and 3 touchdowns. Luck’s completion percentage was a remarkable 70.2%. It was announced on Sunday that Notre Dame has accepted the invitation to the Sun Bowl on December 31st in El Paso, Texas against a soon to be renewed rival in the Miami Hurricanes. It will be the 24th meeting between the Irish and Hurricanes and the first between the two high profile schools since 1990. The Irish hold a 15-7-1 series lead, winning two of the last three- both being in South Bend in 1988 and 1990. "This is absolutely unbelievable," said Sun Bowl Association president Amen Ayoub Sunday in a teleconference announcing the pairing. "This is the greatest game that we've ever put together here in the 77-year history of the Sun Bowl and we're excited to have both universities come to El Paso later this month." To Sun Bowl organizers, brand value alone, more than both teams' 7-5 records, made dollars and sense. This is the second bowl appearance in the past three years for Notre Dame. The Irish didn’t accept any bids last year after finishing 6-6 and were dealing with the aftermath of the firing of then head coach Charlie Weis. Weis last led the Irish to a bowl victory in 2008 at the Sheraton Hawaii Bowl against Hawaii in which they trounced the Warrior’s 49-21. "The nice part of this, the University of Miami has got a tradition in the past and the present," Kelly said. "Certainly, when you talk about some of the great programs, Miami's going to be involved in that. 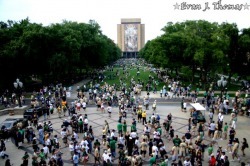 ... Just walking around [ND's campus], there's a great buzz; our kids are excited about the matchup." "He's been cleared," Kelly said of the senior from Altamonte Springs, Fla. "We'll be careful with him and make sure we have the right, you know, amount of practice leading up to the game for him. We'll practice three times next week with weight training and conditioning. ... We don't want to get too far ahead of ourselves." Williams, a stout run-stopper who watched his teammates improve in his absence, made it clear he's more than ready to get back on the field. "I think it's going to be fun," Williams said. "I'll be glad to be back and the team is very excited. I'm thinking [I'm] about 100 percent right now. I feel great." 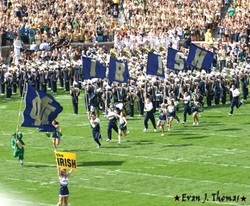 Electric… That was the feeling as new head coach Brian Kelly led the 2010 version of the Notre Dame Fighting Irish onto the field Saturday at an unseasonably cooler Notre Dame Stadium. Kelly stated before the game that the pageantry of college football and seeing his first game at Notre Dame was a little overwhelming. The first quarter featured a slew of short passes, draws and dump offs by junior Quarterback Dayne Crist in Kelly’s spread offense. The offense moved the ball in those first ten minutes but with the short plays didn’t get down the field too far. Late in the first quarter, Irish defensive back Darren Walls snagged an interception off of a misguided pass from the Miami Hurricane transfer and Purdue quarterback Robert Marve. The interception set off a series of big runs by the Irish offense and sophomore Cierre Wood and included some great downfield blocking by All American Junior wide receiver Michael Floyd. Seven plays and 84 yards later and senior running back Armando Allen scampered into the end zone for the first touchdown in the Brian Kelly era. The first quarter ended with Crist having only one incompletion and the Irish leading 7-0 over the Boilermakers. The second quarter began just as the first one ended as Notre Dame’s offense moved briskly down the field. One highlight included Crist, who is coming off a season ending knee injury last season galloping down the sideline for his first significant run of the season. Crist showed no ill effects of the knee injury as he smartly ran out of bounds before taking a hit. After a few incompletions out of the end zone, the Irish added a short field goal for a 10-0 lead with 11:10 remaining in the half. The Boilermakers finally showed some life in the remaining minutes of the second quarter as they brought in red shirt freshman Rob Henry and used some trickery to move the ball on the Irish defense. Purdue did manage to get the ball inside the Notre Dame 10 yard line but the Irish defense held their own and made some great tackles in holding Purdue to a field goal. Notre Dame’s offense though countered in the final two minutes of the half and moved the ball on the Boilermaker defense. With some swift running by Allen and Wood, the Irish put themselves in position for a 47 yard field goal attempt. Senior kicker David Ruffer nailed the long attempt and put the Irish up 13-3 with under a minute remaining. Kelly stated at halftime that his defense came up big in the first half and made some good plays. He also said that Crist was trying to be too perfect on his passes and just needs to let the game come to him. At the half, Crist completed 12 of his 16 passes for 123 yards. The talk of the first half for the Irish was the emergence of the Irish running game in Kelly’s spread offense. The Irish rushed 19 times and tallied 107 yards on the ground including the one touchdown run by Allen. The second half started out with a bang as junior defensive end Kapron Lewis-Moore sacked Marve on the first series for a 15 yard loss. After a three and out by the Boilermaker offense and a punt from deep in Purdue territory, Armando Allen took the 49 yard punt and returned it 40 yards to the Purdue 30 as Allen used his blocks wisely to weave in and out of traffic to give the Irish great field position to start the half. After a couple of quick passes and a nice run by Cierre Wood, Crist connected with freshman wide receiver TJ Jones in the end zone for an Irish touchdown as Notre Dame padded its lead to 20-3 with a little more than ten minutes left in the third quarter. On the next Purdue series, Ethan Johnson and Ian Williams manhandled the offense line and added two big sacks to back up the Boilermakers into their own end zone for a 4th and 32 punt. On the next Irish offensive possession, Crist completed a nice toss down the sideline to Michael Floyd for 34 yards as Floyd had a defensive back draped all over him. On the next play, Floyd went over the middle and hauled in a pass from Crist at the Purdue 5 yard line that should have been a sure touchdown and then promptly fumbled the ball into the end zone as Purdue picked it up for huge turnover. Marve and senior running back Dan Dierking led the Boilermakers downfield into Irish territory. Purdue's offense then fizzled at the ND 5 yard line as Dierking came up short on a 3rd and long as the third quarter came to an end. Purdue being down 20-3 took a gamble and attempted a 4th and 1 at the ND 5 yard line. The Irish defense blew by the lineman and got into the face of Marve and forced him into an ill advised throw that ended up being tipped at the goal line by Gary Gray and then grabbed by defensive lineman Ian Williams for his 2nd career interception. On the first play of the next Irish possession, the Purdue defense stuffed Armando Allen in the end zone for a safety as they cut the ND lead to 20-5 with 14:45 left in the game. After a free kick, the Boilermakers and Marve guided the offense downfield on the Irish. Facing another 4th and 1 at the Notre Dame 22, Marve took the snap and as the offense crashed right Marve took the bootleg and went left beating the defense to the end zone for the Boilermakers first touchdown and cutting gap to 20-12. Cierre Wood took the kickoff and had a nice return before putting it on the ground. Lucky for the Irish, Zeke Motta pounced on the ball for the recovery. On the next Irish series, the offense line gave up consecutive sacks. After a sack and three and out Purdue had to kick. The kick landed at the Irish 47 giving ND pretty good field position in Purdue territory with just over six minutes remaining. Crist led the Irish on the drive that halted at the 26 yard line for a field goal attempt. David Ruffer connected on his third field goal of the game to give the Irish a 23-12 cushion with just under five minutes remaining. Ethan Johnson added another sack on the following Purdue possession. Sophomore linebacker Manti Te’o made a great stop on a wide receiver screen to force the Boilermakers into their third 4th down attempt at a conversion. The Irish defense again forced Marve into a inaccurate throw that basically dashed the hopes of any type of Purdue upset with 2:03 left. With a couple of runs and kneel downs to run out the clock the Irish held off a slight Purdue comeback with a final score of 23-12 to give Notre Dame and Brian Kelly their first win of 2010. Today marks the beginning of the 2010 NFL Draft in New York City, Round 1 is in Prime Time on ESPN. This is the day that Jimmy Clausen has been dreaming of as a kid. All the hard work, all the preparation, and all the injuries he sustained, all the negative comments about not being able to win at Notre Dame. This is Jimmy’s time. It’s guaranteed that Clausen will be a first round choice. His potential suitors through draft experts are the Oakland Raiders, Cleveland Browns and the Buffalo Bills. Talk is that he may fall to the back end of the first round depending on other teams needs. The Kansas City Chiefs should also be in the mix for Jimmy’s pro services since his former college coach at Notre Dame; Charlie Weis is now the offensive coordinator for KC. Questions surround Clausen though on draft day. Clausen admitted during an ESPN film session to former NFL head coach and current Monday Night Football color announcer John Gruden that as he stated “lazy” on a deep out play against USC and safety Taylor Mays. Gruden ripped him on his lazy comment and said in the NFL he won’t be able to get away with making those throws. Clausen wasn’t as highly touted as Sam Bradford, Tim Tebow or Colt McCoy during his college career. Jimmy didn’t win the “Big Game” or a national title or the Heisman at Notre Dame as he had hoped coming in as the top freshman quarterback from high school. Clausen’s Notre Dame teams didn’t frequently blow out other teams like the previously named prospects did throughout their college careers. But Clausen knows how to play in pressure packed games and how to come from behind in games. 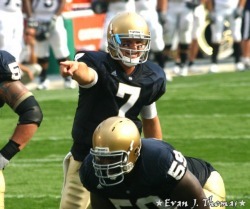 Clausen ran a pro style offense at Notre Dame and has the skills and pedigree to be a top-flight gunslinger in the NFL. Clausen’s future begins tonight. Did The Media Hype up Lindsey Vonn Injury for Rating Boom? Let’s start of by saying that I am not a Lindsey Vonn hater. The 25-year-old statuesque blond with model looks is a world-class skier with all world talent. Vonn is competing against the best of the best that the world has to offer. But wait a minute! Has Vonn become the subject of an over exaggerated shin injury so the NBC brass and the US Media could hype up the darling of the 2010 Vancouver Winter Olympics for ratings? We know the Olympics are all about the drama of competition. We see the way the media has to have a dramatic story behind every competitor and their rise to stardom from the small towns, the farms, or the hardships that they grew up with to get to this point. Was anyone really THAT interested in watching the women’s downhill until hearing of the potential set back to Vonn? We first heard the reports about 2 weeks ago that Vonn had a serious shin injury that may potentially keep her out of the Olympics. All skiers have nagging injuries whether it’s back stiffness, knee, ankle, joints or just bumps and bruises from training. Does anyone really think that the shin injury would have stopped Vonn from pursuing her Olympic dream? With all the grueling hours of training would an injury like this really hold Vonn back from competing in the biggest moment in her career? I think not. We all recall the image of Curt Shilling and the bloody sock and what he had to overcome to pitch in the 2004 World Series. This time we have Lindsey Vonn sitting at the Olympic podium discussing the probability of her being able to overcome the injury and compete in the games as throngs of reporters scribbled every word and flash bulbs from dozens of photographers snapped away. Since Vonn has underperformed in previous Winter Games and has never won gold, could the injury be a potential excuse in case she failed? She had talked about the pressure of performing and how she relished it; how she was so deeply aware of Bode Miller’s hype-and-collapse in Turin, and how she would make sure his failures did not happen to her. If she overcame the injury and won gold she would become an iconic figure in the Winter Games. This is exactly what NBC wants! So it came down to Wednesday’s showdown on the bumpy and blood stained Franz’s run. A handful of competitors met their match on the hill as they lost control and wiped out one by one before Vonn’s attempt at Olympic Gold. Vonn furiously raced down the slopes, gliding and weaving her way to the finish line while hundreds of flag waving and cowbell ringing family and fans cheered her every move. Vonn crossed the finish line and collapsed on the sun-drenched snow in sheer delight of her accomplishment. Her championship time was 1:44.19, but her winning time was secondary to the grinding competition of the day. Vonn embraced her husband and cried for several moments as TV cameras and photographers fixed their lenses on her every move. Vonn showed no signs of discomfort during her gold medal run. “My shin was killing me but I somehow found the aggression and intensity I needed to have a good run,” Vonn said. “When I crossed the finish line and seeing my name up there at No. 1 it was overwhelming, was the best feeling of my life.” As she stood during the medal ceremony Vonn had tears of joy in her eyes as the gold medal was placed around her. It was a gritty performance from Vonn nonetheless. I am not taking anything away from her as a competitor, though I can question how all this was manipulated to the Olympic viewers by NBC and the media. Vonn will go down in history as a fighter and vicious competitor. She will be offered million dollar endorsement deals. We will be subject to her hocking products on various commercials like moisturizers, hair products and dietary supplements. Her blond locks and good looks will be gracing the pages of every major magazine. She will be the subject on every major talk show as she discusses her personal and professional setbacks. Vonn’s talents made her a sports figure, but the media has made her a household name. The yearly IHSA State Football Championship games recently concluded a few days ago on a breathtaking weekend after Thanksgiving. High School football teams from all over Illinois converged for their final games of the 2009 season in historic Memorial Stadium in Champaign, home of the Fighting Illini. These teams, these players, these coach’s football seasons began in June during the immense heat of the summer with 2 a days. The weeks of training are geared to take on the task of the upcoming season. On the football field is where the men are separated from the boys, some kids quit, some get injured but they all do this for one common goal, a championship for their school, for their community, for their teammates. 99.9% of these young men will walk off the field having never known what playing in a championship game means, but the few that do will either find out the thrill of victory or the agony of defeat. Obviously only a handful of schools will get a chance to play in the season’s defining game. I have never partaken in these events but have seen them first hand and wished I had played football while I was in school. I live within minutes of Montini and I graduated from Glenbard West in 1993 so I have reason wish the best for both schools. 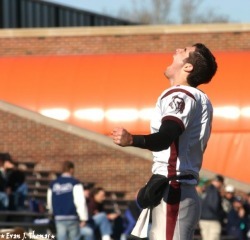 I was on hand to witness and work two of the best games in IHSA football history on Saturday. The first pairing for the 5A Championship game was between the powerhouse Joliet Catholic Academy Hilltoppers (11-2) and Montini Broncos (9-4). Talk about David vs. Goliath scenario, Joliet Catholic has won 13 state titles to Montini’s 1 state title and Joliet Catholic was favored in this match up. The game began with two quick Hilltopper touchdowns off turnovers that put Joliet Catholic up 14-0. Montini answered with touchdowns of their own to keep themselves in the game. After trading touchdowns in the second half, Montini was down 28-21 with under a minute remaining. Bronco’s senior quarterback Brandon Pechloff guided the offense into Joliet Catholic territory and moments later found an open receiver in the back of the end zone to bring the Broncos within one point with 34 seconds remaining. Montini head coach Chris Andriano promptly called on his kicking team to line up and attempt the game tying extra point. Coach Andriano then called a timeout to think what to do next. As the Broncos came back out onto the field coach Andriano decided to make the gutsy decision to go for the two point conversion. Now, after weeks and weeks of tiresome practices and 13 hard fought games the Broncos season will culminate on one final play. Everything these kids battled for all season long comes down to this and will ultimately decide whether these young men will feel the jubilation of celebrating a state title or wallow in defeat. Coach Andriano made his decision to go for it. As the offense walks up to the line of scrimmage no one was sitting, everyone was on his or her feet and at full throat in hopes of what the final play will bring for Montini. Bronco quarterback Pechloff lined up behind center, he took the snap and dropped back to survey the field, he spotted his wide receiver who had lined up on the right side of the formation running a drag route down the goal line. Pechloff wound up and tossed a perfect pass to the goal line as he led the receiver for a diving grab to convert the two-point conversion. Once the Broncos on the sidelines realized the conversion was good, the players rushed the field in celebration of their second state championship. The overjoyed players, coaches, family and friends gathered for the festivities following the game and the presentation of the championship trophy. On the other side of the thrill of victory and the agony of defeat spectrum we had the IHSA 7A Championship game pitting #2 Glenbard West Hilltoppers (13-0) battling #3 Wheaton Warrenville South Tigers (12-1). Glenbard West is gunning for their first state title since 1983 and their second overall in school history. The Hilltoppers lost in last season’s semi-final game to eventual state champion East St. Louis. The Tigers during their playoff run have ended the seasons of St. Rita and East St. Louis. Those victories have put the Tigers in their second championship game in 4 years. Both teams emerged from the tunnel under a falling darkness and bright lights of Zeppke field. The game got under way with the Hilltoppers and senior quarterback Tyler Warden hurling a careless pass on his first attempt for an interception. After West stopped the Tigers on the goal line and got the ball back at their own 1-yard line, Warden three plays later lost a fumble on the Glenbard West 3 yard line. Two plays later WWS scored on a one yard push to go up 7-0. West added a field goal in the first half to cut the deficit to 7-3 going into halftime. WWS started the second half with the ball and on the third play of the half Tigers senior quarterback Reilly O’Toole forced an ill-advised pass that was intercepted and returned for a touchdown by the Hilltoppers All-State linebacker Connor Loftus. The teams traded touchdowns and field goals in the second half to make the game 17-17 with a few minutes remaining. The Hilltoppers had a chance to go ahead with 47 seconds remaining when a 28-yard field goal went wide right missing by barely a foot. Time eventually ran down in the fourth quarter as the game went into overtime-tied 17-17. In the first overtime both teams traded touchdowns. In the second overtime, the Tigers began with the ball and on fourth down at the Glenbard West one yard line scored the go ahead touchdown. With the overtime rules giving each team a chance to score in overtime the Hilltoppers get the second possession of the second overtime. After three imperfect play calls that went for naught the game hangs in the balance, a fourth and goal with the state title and undefeated season on the line for the Hilltoppers. As the teams line up for what ultimately is a defining moment the stadium is going crazy with anticipation. Warden takes the shotgun snap and rolls right, he has about four seconds before his potentially game winning pass sails over the head of a jumping receiver and unceremoniously drops to the ground. As the ball sat motionless on the ground after the incompletion the players on the Glenbard West side became grief stricken. Some players fell to their knees in disbelief, some players took their frustrations out on helmets and other items within their grasp and some players sat with their heads in the hands trying to hold back tears. 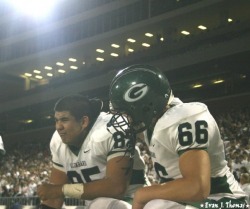 Some weren’t able hold back emotions and were consoled by other teammates, coaches or family members. Tears of joy and tears of sadness flow after each game as each team wanders up to the podium to receive their trophies. The trophy sitting in the school trophy case will always be a reminder of what that day meant to each of these young men. Now that Brian Kelly has been on the job at Notre Dame for just over a week, I am going over a mock first week checklist for Coach Kelly. Enjoy! - Return Charlie Weis’ Super Bowl rings that he left in the desk drawer. - Take down the autographed photos of former Michigan quarterback Tom Brady that were gracing the walls. - Have the movie “Rudy” playing on a continuous loop in my office Blue Ray player. - Follow up on future Irish starting quarterback Dayne Christ and his scheduled rehab. - Wrap wide receiver Michael Floyd in bubble wrap so he doesn’t get injured this offseason. - Learn the names of all janitors who sweep and mop the floors. - Remember to say 100 Hail Mary’s before leaving church. - Contact University of Washington about the possibility of Nate Montana returning to Notre Dame in a backup roll. - Hope that “Rudy, The Golden Gnome” reaches 100,000 friends on Facebook!! Search: “Rudy, The Golden Gnome” and become a fan! - Hire an offensive and defensive coordinator; I think Charlie Weis may be looking for a coordinator job. - Set up a 5-year plan on how not to lose to Navy. - Make sure to rid my closet of all things red and black. - Send all Cincinnati hate mail to Ann Arbor, Michigan. - Thank ND Athletic Director Jack Swarbrick for this job every time I see him. - Walk the campus of Notre Dame and think to myself how small Cincinnati was compared to this. - Silently search for a location on the stadium grounds for where they will erect my bronze statue after winning a national title.